I have wanted to read this one for a long time, and was happy to find this little beauty for $2 at Half Priced Books. I love it when that happens! Cindy Pon and Malinda Lo are touring this summer. The Diversity in YA Tour is coming to Austin next week so I knew I needed to bust this one out. Glad I did! When Ai Ling turned sixteen, she began to hear inner thoughts of those around her. It all started subtlety, but when she turned seventeen and was suddenly unbetrothed, her "abilities" strengthened. When her father doesn't return from a visit to the Palace of Fragrant Dreams, Ai Ling decides to journey out on her own to find him - in ancient China, this is unheard of. She immediately finds herself in trouble and a young man, Chen Yong, rescues her from drowning in a lake filled with underwater creatures. Creatures that spoke to her, creepy. Their bond is almost immediate and Ai Ling finds herself wanting to be close to him. Like, crazy close in a totally*ish non-sexual way. I'll save this one for you to read about, but her abilities go far beyond what they appear to be in the beginning. Before long, the both decide to travel together to the palace, for he is on a quest to locate answers about his childhood and where he came from. The two run into several obstacles and creatures along the way - a one-armed tribe, multi-headed goddess, and sea dragon. These...things are what make their journey difficult and their kinship stronger. I really enjoyed the connections between the creatures and the old stories from the books the two grew up with; The Book of the Dead and The Book of the Divine. Soon, they find their journeys are intertwined, and together they must fight an evil that has been running amuck for centuries. To say I was pleasantly surprised by this book would be an understatement. Fantasy is not one of my strongest genres, but the first 50 pages convinced me I was in for a great ride. I was totally enthralled with Ai Ling's home life and the difficulties she went through with her betrothed. I really enjoyed getting to know her and her family. The bond she shares with her father is special, and that sweet relationship carries her on her tough journey to find him. For me, Chen Yong was more than a secondary character. His story was complicated and his quest to find out who he is and where he came from kept me captivated. Watching Chen Yong and Ai Ling's relationship grow warmed my heart. I was, and still am, rooting for them even though the odds are not in their favor for more reasons than one. I can't wait to read more about them in the next book. 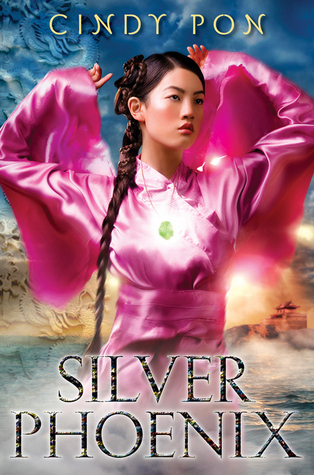 Silver Phoenix is a fantastic fantasy book with adventure and cultural elements (still not sure which are imaginative or drawn upon real traditions - kudos to you, Pon) that will want you to explore ancient China and Asia. Oh, and buy book two, Fury of the Phoenix. Diversity in YA Tour - I hope you will check out the lineup and see if they are coming near you!